I don't know about you, but I needed something excellent to lift my spirits. 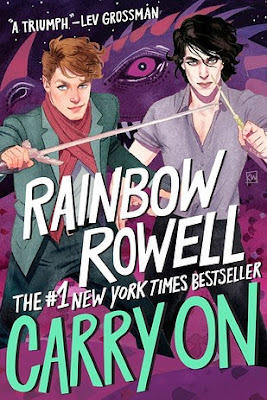 A huge thanks to St. Martin's and Buzzfeed for giving us the upcoming paperback cover of Rainbow Rowell's Carry On. The cover art is by none other than the incredible Kevin Wada. I mean, I purchased two copies of Leigh Bardugo's Crooked Kingdom just so I could get the one with his gorgeous illustrations inside the jacket. He captured Kaz and the gang so perfectly, I had to have them. And I think he's captured Simon and Baz so well here. Due out May 9th, it will make the perfect lender copy. I'm thinking it's time for a reread . . .
"You have to pretend you get an endgame. You have to carry on like you will; otherwise, you can't carry on at all."